1. Apply a thin, even coat of OPI GelColor in Made It to the Seventh Hill, cure for 30 seconds in an LED lamp, and repeat to achieve an opaque, rose gold base. 2. 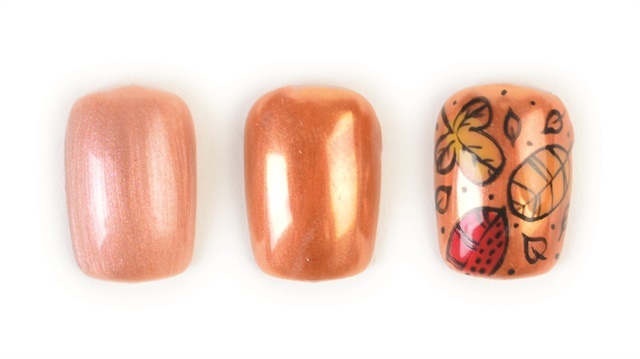 Apply OPI ChromeEffects in Bronzed by the Sun and Great Copper-tunity in an alternating, diagonal pattern. 3. Using OPI GelColor in Big Apple Red, Sun, Sea, and Sand in My Pants, and No Tan Lines, apply random brush strokes and cure for 30 seconds. 4. Use detailing brush and OPI GelColor in Black Onyx to paint a thin outline of large leaves over the colors applied in the last step, and add small leaves or dots to fill empty space. Flash cure the leaves for at least 15 seconds to keep lines fine. Finish with OPI GelColor Top Coat and cure for 30 seconds.